UPDATE -- The Washington Post is out with fresh reporting about the piece of information from the Inspector General's probe that prodded FBI Director Christopher Wray to relieve his deputy, Andrew McCabe, of his duties. The issue was apparently related to the latter official's role in potentially slow-walking the Bureau's response to developments in its Clinton email investigation (regarding Anthony Weiner's laptop), perhaps with an eye toward running out the clock on the election (which obviously did not end up working out). As John Sexton notes, that's not the only Clinton-endangering probe McCabe -- whose wife has significant ties to Clintonworld -- has been accused of bogging down. Another point, on credibility: Liberals instinctively rushed to McCabe's defense when he was ousted yesterday, including former Attorney General Eric Holder. But what about this? 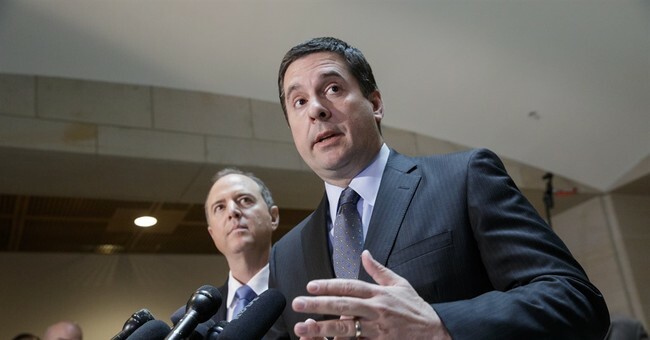 ORIGINAL POST -- To recap, the House Intelligence Committee voted along party lines last night to make public a classified memorandum, written by Republicans and drawn from US intelligence, pertaining to some element or elements of the overall Russia matter. The specific subject matter of the document remains unclear, although the surveillance of former Trump aide Carter Page appears to be at least somewhat relevant. Democrats have objected vociferously to publishing the memo, claiming that it paints an inaccurate picture of reality, based on incomplete information. They've drafted their own private memo, which the committee voted unanimously to make available to all House members -- but not the public -- last evening. (For what it's worth, I've come to believe that given the volume and severity of the various charges and counter-charges, both memos should be released, along with as much supporting raw intelligence as possible, with a careful eye toward national security considerations). My Democratic colleagues didn’t want us to find this information. They did everything they could to keep us from finding this information. I think it will be embarrassing to Adam Schiff once people realize the extent to which he went to keep them from learning any of this. That would be the embarrassment. 3 "direct" sources said Wray was SO protective of McCabe that Wray threatened to resign over pressure to oust him.